It’s a five minute drive from the town of Benitachel. Make sure to ask for “la cumbre del sol” and everyone will know which direction to point you towards. 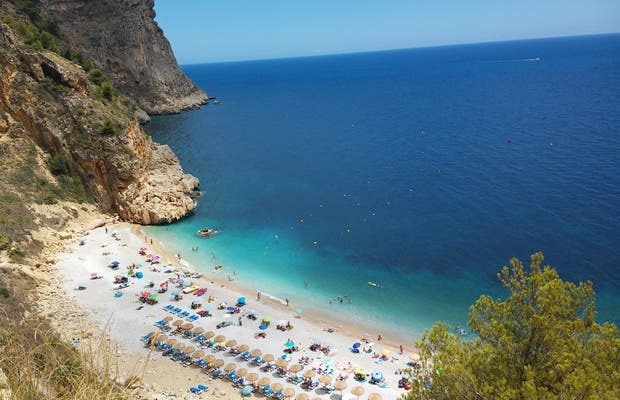 It’s another one of the many gorgeous coves that lie along the white coast in Alicante. The water is clean and always very pretty in color. There are parking lots, scuba diving zones, hiking paths, and food and drink stands. It’s definitely a heavenly place in Alicante that has been somewhat protected from mass tourism and urbanism, which has, unfortunately, been a problem throughout Alicante. To arrive at this cove, you need to get to the village of Benitachell and then ask for the Cumbre de Sol housing development. It’s a bit tricky to get to, but once you arrive it’s really worth the trip. It’s a peaceful place and has a small beach bar in case you forgot to bring food. It’s small, but pretty, and far from all the mass-tourism areas. Depending on what time of year you go, you might even find yourself there alone! It’s a great place to go swimming or diving, or just enjoy the natural beauty. The parking area is on a hill so, if you don’t get there early, you might find yourself parking a nice hike up.